Once a year, on International Women’s Day, we judge and reflect on how far we have travelled on the long, and sometimes it seems never-ending, road to gender equality. What did we achieve? What will we achieve? It seems unfair — just 24 dedicated and precious hours to share thoughts, perhaps take stock and set a new or different pathway for the 12 months ahead. I like that International Women’s Day was originally called International Working Women’s Day and was established by the United Nations as a day to keep track on economic, political and social achievements for women. We need to tackle some of the challenges still facing us on this road to equality. This is relevant in all walks of life. In the arts, where only two of the top 100 individual works sold in the past five years were by two women and where only 4% of artists in the Museum of Modern Art are female. And in business where in 2016, the average board size globally was 11.5, with an average of 2.1 female members, and only 5% of board chairs were female in 2016. 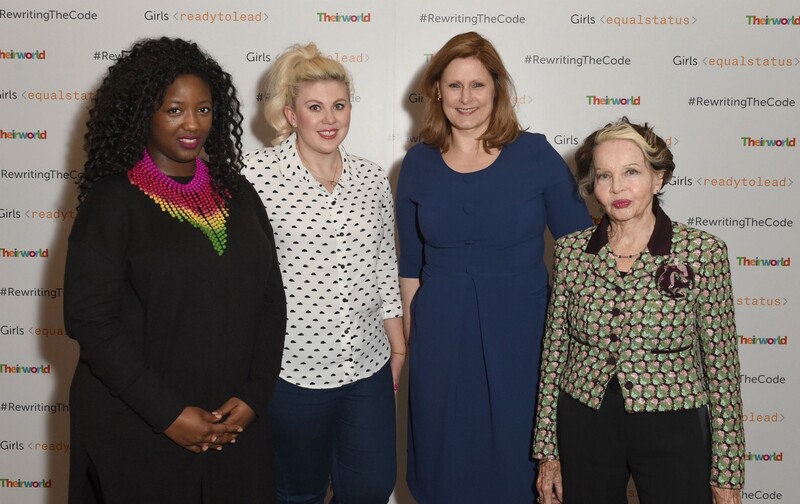 This year global charity Theirworld has launched the #RewritingTheCode campaign which aims to change attitudes and behaviours that prevent girls and women from succeeding, leading and fulfilling their potential. Embedded values shape our world in the same way code defines what you see on a website. While we often highlight the obvious challenges we see around us we also need to expose the codes that are too often hidden out of view. Codes that result in girls around the world not having equal access to education. Codes that stop women having equal pay and equal opportunity in the workplace. So the #RewritingTheCode campaign is using the computer embed symbols < > to identify what needs to change. We can expose bad code: <girly, hysterical, bitchy>. We can expose facts and statistics: Equal Pay Act < 1970> equal pay <2069>. Or global problems, such as School <not for girls> Bride <child>. But our job is to go beyond this if we are rewriting the code so the bad code can be crossed out so that girls <secondclass> becomes girls <equalstatus>. Women <emotional> becomes women <opinionated> and feminist <manhater> becomes feminist <everyone>. And then for the real computer coders we can signify a new beginning for girls that continues on, without an end </secondclass><equalstatus> . There are a number of ways you can join the campaign on social media, in your school or workplace by visiting theirworld.org. Please help us create a future where no girl is left out of a classroom, a boardroom a decision or even a conversation. Women are a hot topic. Are you ready for the future?